Many of you, I hope, are familiar with L.K. Madigan’s work: her debut novel, Flash Burnout, won the William C. Morris Award. Sadly Lisa was only able to share one more book with us, The Mermaid’s Mirror, before cancer took her from us, shockingly fast. 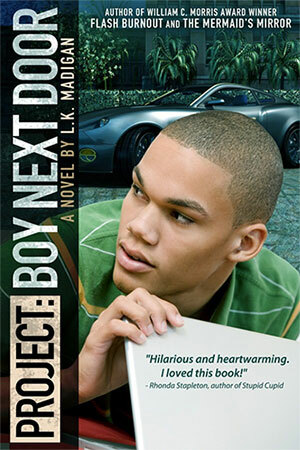 Being the son of a mega-famous mogul isn’t all it’s cracked up to be, which is why super-smart but socially awkward teen Melvin Pepper wants to try something new: anonymity. To attend a regular high school, get a normal job, meet real people. A break from the pressure and facade that come with crazy wealth and a world-renowned last name. But Mel quickly realizes that being Mike, his alter ego, isn’t as easy as he’d assumed. He gradually makes friends at work and school and becomes involved in the radio club, plus navigates the rocky waters of first crushes and first kisses. However, he discovers someone out there is on to his secret and is threatening to expose it. And that’s not all. One of Mel’s new work friends is hiding a dark secret of her own, and Mel feels helpless to make things better for her. He struggles with juggling two very different identities, balancing jealous old friends and nosy new ones. Yup, Mel’s in way over his head… and the only chance he has to make everything right is to be true to himself. Doesn’t that sound awesome? 🙂 The book will be released later this week, and you can preorder from Amazon here. Why not add it on GoodReads too? Let’s help Lisa’s words reach even more readers!